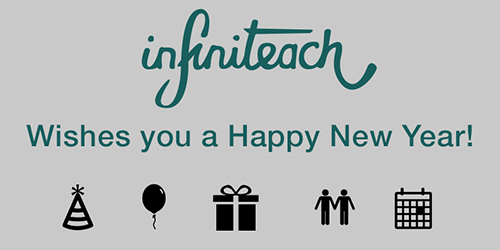 Our New Year’s Resolution: Infiniteach will continue to bridge the gap between unmet potential and success for individuals with autism. In a world where everyone is touched by autism, why aren’t we doing more to support the estimated 1 in 45 individuals now being diagnosed with an autism spectrum disorder? The progress we have made in finding successful autism interventions have not kept up with the monumental increase in autism rates. There is very little innovation or breakthrough in the autism space. It seems impossible to find even one parent or teacher who believes that the resources which currently exist are enough to help their children and students reach their fullest potential. And the proof of these failings are in the numbers: 66% of individuals with autism that are 2 years out of high school are not engaged in work or school. An appalling 25% of of these individuals have not spoken with a single friend in the past year. The isolation that individuals with autism and their families face is unacceptable. Infiniteach was founded because we know we can do better. Our founders have decades of experience and success within the autism community. We know that we can scale that success by providing meaningful, effective interventions via technology. Technology allows greater access to life changing tools from both a geographic and financial standpoint. Families of children with autism are no longer bound to resources in their vicinity. Nearly 75% of those that care for someone with autism are dissatisfied with the resources in their local areas (Autism Speaks). They drive an hour or more for services, they do not have access to appropriate recreational activities, and lack access to respite services. And financially, the lifetime costs for an individual with autism are between 1.4 and 2.4 million dollars for educational services, medical expenses, and lost wages. Families that can’t afford upwards of $150 per hour for direct therapy are left feeling powerless to help their own children. Infiniteach has chosen to lead the way in a new era of autism intervention. In 2015 we built and launched Autism Core Skills, a revolutionary platform that helps build critical and academic and social skills. By using the power of the iPad we can teach, track, and individualize lessons like never before. It is a platform that will only improve and grow into 2016 with feedback from the autism community. Infiniteach exists to help realize the hopes and dreams of every child with autism and their family. We are working to support a community which is often underserved, but so deserving of society’s greatest efforts. The love and passion we have for the autism community is fueling a lifelong commitment to build a better future. And while we can not do it alone, we promise to do everything we can, the best that we can. Here is to 2016 – the year which will bring the world closer than ever before to fulfilled joy, potential, and opportunity for all within the autism community. And if you are looking for a free resource to help individuals with autism be successful on New Year’s, please check out our New Year’s Social Guide here!